North Carolina legislative coup: an attack on democracy. North Carolina Governor-elect Roy Cooper at a Hillary Clinton event on Nov. 2. Republicans in the North Carolina General Assembly staged a shocking legislative coup on Wednesday night, calling a second special session and proposing a raft of measures designed to strip power from the newly progressive state Supreme Court and governorship. This last-minute power grab marks an alarming departure from basic democratic norms—a blatant attempt to overturn the results of an election by curtailing judicial independence and restructuring the government to seize authority lawfully delegated to the incoming Democratic governor. The trouble in North Carolina began when Republican Gov. Pat McCrory lost his re-election bid, likely because of his support for the anti-LGBTQ law known as HB2. At the same time that voters replaced McCrory with Democrat Roy Cooper, they ousted a conservative state Supreme Court justice in favor of a progressive. That tilted the balance of power on the court to a 4–3 liberal majority, ending an era in which the court’s conservatives could rubber stamp the legislature’s voter suppression and gerrymandering. Because of this gerrymandering, Republicans retained a supermajority in the state legislature, even while losing the governorship and Supreme Court. (A federal court ordered the legislature to redraw its maps and hold new elections, but those won’t occur until 2017.) Rumors floated around the capital that Republican legislators would either throw out the results of the gubernatorial election and reinstall McCrory by citing baseless allegations of election fraud or add two seats to the Supreme Court and let McCrory fill them, restoring Republican control. McCrory eventually conceded defeat when a partial recount could not close his 10,000 vote deficit. But concerns over court-packing grew when McCrory called a special legislative session, ostensibly to pass a disaster relief package. Overhaul county election boards to prevent Democratic control. Current law states that each county election board must be made up of three members, two of which should come from the governor’s party. The new proposal would give each election board four members—two Democrats and two Republicans—to prevent Democrats from taking control of the boards. Overhaul the State Board of Elections by merging it with the State Ethics Commission and increasing its size. Right now, the law states that the election board must have five members, with three from the governor’s party. 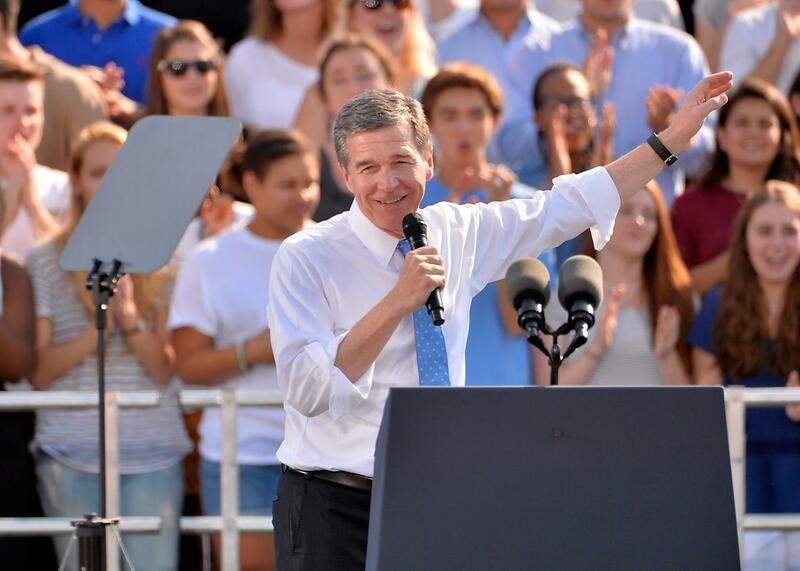 The new law would give it eight members—four Democrats and four Republicans—to forestall a Democratic advantage when Cooper takes office. Allow a Democrat to chair the State Board of Elections in odd-numbered years—when there are typically no elections—and allow a Republican to chair the board in even-numbered years—when state and federal elections are normally held. Make Supreme Court elections partisan and introduce party primaries. Republicans believe they lost the 2016 Supreme Court election because the candidates lacked a partisan identification. Completely change the appeals process in order to limit the state Supreme Court’s authority. When Republicans took power, they provided citizens with the right to appeal constitutional challenges from superior court directly to the state Supreme Court. The new measure would remove this right, requiring constitutional challenges to be heard by all 15 judges of the court of appeals—which is dominated by Republicans—before reaching the state Supreme Court. Allow McCrory to pick the Industrial Commission chairman, who will serve for the next four years. Under current law, Cooper should have the opportunity to fill this position. Reduce the number of state employees who serve at the pleasure of the governor. When McCrory took office, Republicans increased this number from 500 to 1,500. They now propose reducing it to 300. Remove Cooper’s ability to appoint trustees to run campuses in the University of North Carolina system—and transfer that power to the state legislature. Require Senate confirmation of Cooper’s Cabinet appointments. McCrory’s appointments did not require Senate approval. Confirm McCrory’s closest ally, state budget director Andrew Heath, to a superior court judgeship. Abolish car-emissions testing in many counties; eliminate some state environmental reports; and remove scientists from certain state boards tasked with protecting public health, replacing them with industry representatives. Although that court invalidated the law, Republican-controlled county election boards implemented much of it anyway, curtailing early voting and slashing the number of precincts in majority-black counties. These election boards also allowed Republicans to disenfranchise black Democrats—without their knowledge—in violation of federal law. With Cooper’s victory, Democrats were poised to take control of these election boards, thereby restoring voting rights throughout the state. The new measures will deny Democrats this right. They will also significantly delay challenges to the legality of voter suppression methods, drawing out the process for years before the state Supreme Court can hear these cases.